Let me emphasise that this is work in progress. I'm experimenting to get what to me is the best texture and taste. 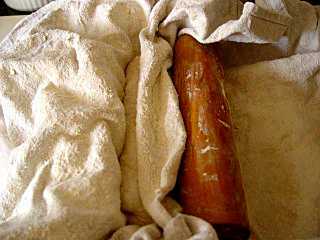 This how I currently make sourdough baguettes. Its not the only way. It may not be the best way. You need to experiment to "dial in" the method to suit your environment, flour, starter and personal taste. 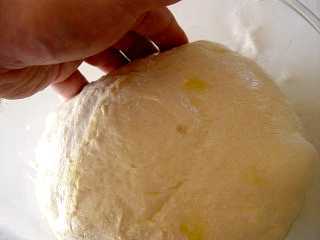 However I hope to show some basic techniques that have general application for handling very wet doughs. 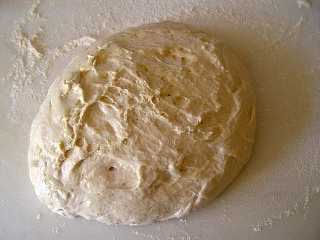 The dough can also be used for other breads and rolls. 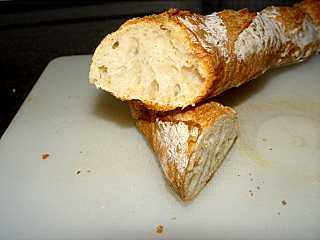 This is a home recipe, but could be scaled for restaurant or small shop use, making a few dozen baguettes. Industrial scale production has different issues. I like big uneven holes and an open texture. To achieve this we need to break some of the rules, which were designed to make the even textured bread thought desirable in the past. This demonstrates my version of the "a l'ancienne" style, where the dough is mixed cold with a long cold fermentation to allow the enzymes to break down the starches in the flour to sugars before the yeast becomes active, so when the dough warms up it is exceptionally lively. Combined with short proof times to give lots of oven spring the result is an open texture.. 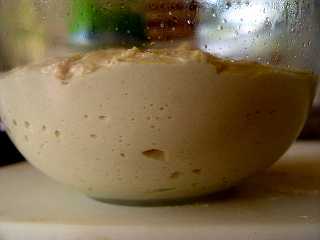 The problem is that the acid in the sourdough degrades the protein and the long starch molecules, making the dough very wet. 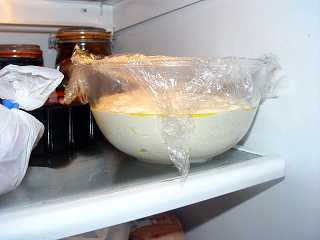 The "clef" (key) is the mother sourdough starter. I store it in a jar in fridge. You can see it seperates into two layers. That is OK, just dig though the liquid layer. I'm actually making a double recipe, since the clef is running a bit low, and the excess will go back into the jar. I'm using a 11.8% protein (actually measured by the nitrogen content) organic white supermarket flour, after some discussion on the sourdough baguette thread, since this approximated to the french type 65 flour. However flour in France is classified by the ash content when burnt at 900C that is they indicate the mineral content (in milligrams) per 10 g flour. In Germany they measure the same thing, but per 100g, of flour, so German flour types are ten times as much and have three digits, such a type 405. 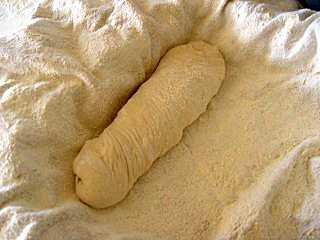 Thus a type 65, a common baking flour, has 0.65% ash. Mineral content is roughly a measure of the extraction rate, or amount of the grain in the flour, since most of the mineral content is in the husk. http://en.wikipedia.org/wiki/Flour#Flour_type_numbers. However this only loosely correlates with gluten and protein content. Traditionally french baguette flour is quite soft. There are some books that indicate french flour has about an 11.5% protein content, so that is today's experiment. Why they indicate in several places on the bag that flour is suitable for vegetarians is unclear to me, It states it only contains wheat flour. 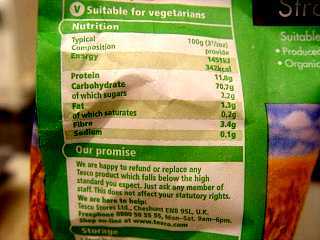 What would non-vegetarian flour have in it? Ground bones? Weavils? Mix together. Ferment for 18 hours at 30C. Temperature is important. Just mix it until its more or less even - time and the bugs will do the rest. 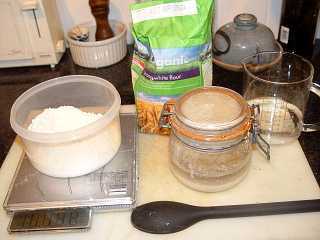 This is in bakers terms a 100% dough, that is the water content (hydration) is 100% of the flour content. Note its like a thick batter, just holding together. This is a wet sponge or poolish. Ths sponge is bubbly and alive. 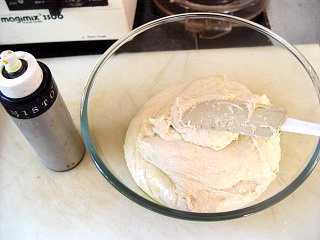 It has thinned out a lot, now like cream, since the acid in the sourdough has attacked the long starch molecules and the gluten in the flour. 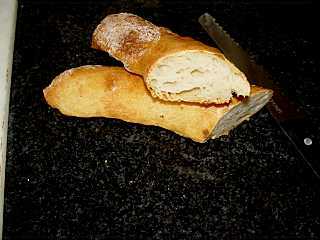 The long sponge development time gives lots of sour flavour to the finished baguette. 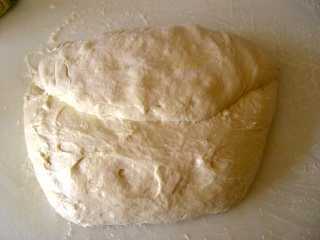 Stage 2: Make the dough. The percentages are bakers percentages, that is relative to the total amount of flour, including the flour in the sponge. Whizz together, without the salt in a food processor for 20 seconds, then add the salt and whizz for another 20 seconds. This short intensive mixing makes a softer dough. 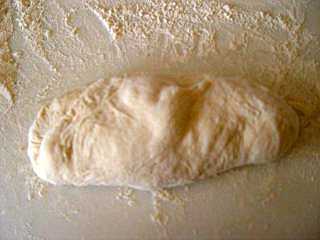 Don't mix a lot more, or you will overmix the dough. 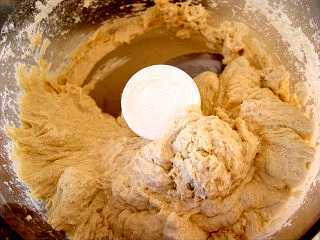 If you use a conventional mixer, mix on high speed until the dough clears the bowl. 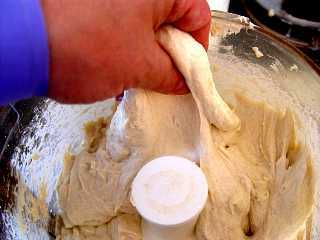 You can also hand mix the dough - again just mix to an even consistency, no need to knead, and I tend to hand mix larger batches. I have experimented with leaving the salt out until you come to shape the dough, and that works well, and gives the bread a saltier taste. Weigh everything. There is no substitute for precision if you want to be able to make the same bread again. The colour is a bit off in the picture - the dough is light cream, rather than orange. After the second mix. This is a very extensible dough that windowpanes well. Turn out into a bowl, cover and put in the fridge overnight (12 hours plus) Timing is not very critical. I mist the top with a hand pumped EVOO spray, which is the silver cylinder to the left. The trigger pump sprays that cleaning products come in, well washed out, also work well to spray oil. The worst part of this is the cleanup. The dough is very sticky. A rubber spatula and lots of hot water helps. Next day not much seems to have happened, but if you look closely uyou will see lots of bubbles in the dough. 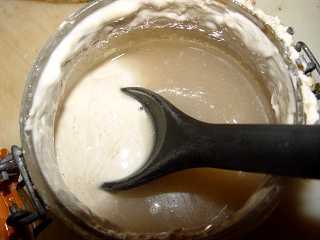 To get it out of the bowl cleanly ease it all round the edge with your fingers (oiled or floured), then lift it out in the piece. 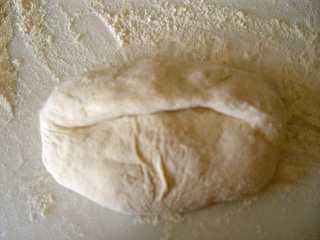 You can only sucessfully handle the mature dough when it is very cold. Put it on a lightly floured (or oiled) pastry board, and fold sides to middle and top to bottom, like a turn in puff pastry. 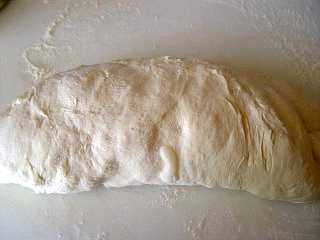 This gently stretches the dough, and because of the coating of flour or oil makes it easier to handle. 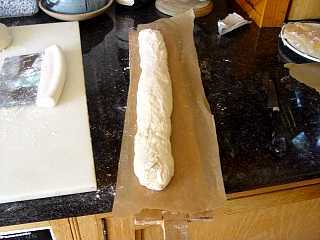 Divide into three baguettes with the traditional weight of about 320g. 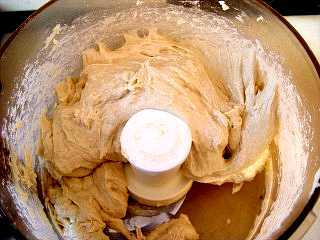 Use a square dough scraper, and press rather than saw the dough. Let the pieces rest for 15 mins. 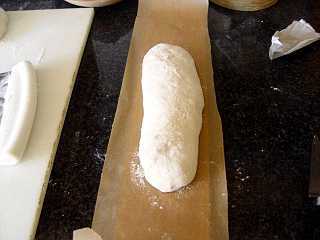 The objective is to make a half-length baguette that gets stretched later, but one where the outside layer is stretched and tight, like the skin on a balloon. Take each piece, flatten a little and again make a turn, long sides to middle. You will need some flour on the board to stop it sticking but not too much, since we don't want the flour pickup to unbalance the formula. Now flaten the top edge a bit (assuming the dough is in the orientation shown), and taking the flap pull it out to stretch and fold it over pressing it down as you go along. The do the same with the other side. 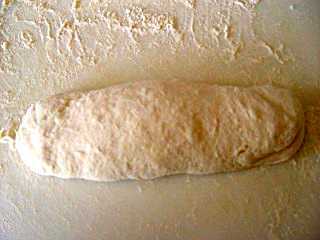 Its to work form the top edge, the edge away from you, forming the baguette. 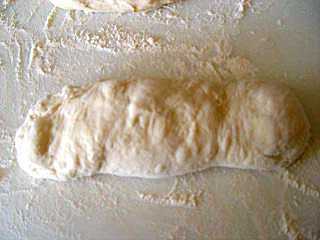 Normally, at this point one would put the dough into a couche, folded floured linen to prove. Mine is an old oven cloth in a half sheet pan, and a short rolling pin. However I'm experimenting with very short or no proof times for this method, instead using intensive mixing and Vitamin C in the dough to provide aeration, so we are going to bake immediately. Let me again emphasise you can ony handle the dough cold, so we need to get it into the oven befoe it warms up and becomes liquid. At this point he oven should be pre-heated to around 500F/250C, with a layer of tiles, brick or pizza stone to bake on. 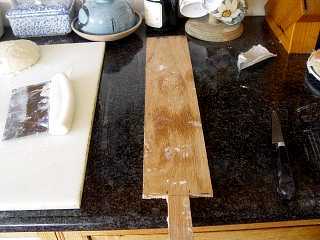 Make yourself, if you do not already have some three baguette boards, the length of your desired baguette, usually what will fit in your oven. Put some baking parchment on it, and put the dough on it. 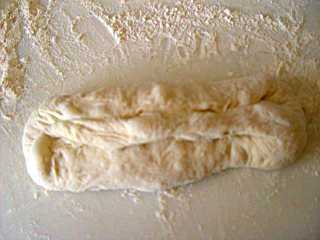 Stretch the dough to the desired length. Repeat for the other baguettes. Slash them and using the boards slide them into the oven so that the baking parchment under the dough is in direct contact with the hot base or stone. Steam, mist or put a cup of water into a pre-heated heavy pan in the oven to provide a burst of very hot steam that gelatanises the outside and gives a shiny crackly crust. (caution scald danger and oven glass or light can shatter if not protected). Close the door. 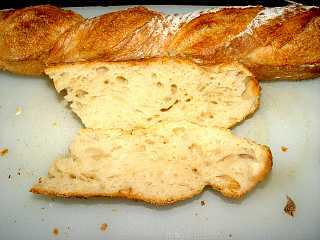 The slashes form the "grigne" (grins) on top of the loaf. Traditionally bakers use a lame, or razor blade on a stick. Cut at an angle, not staight down. and nearly parallel to the loaf. 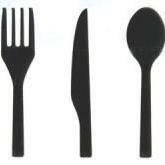 5-7 slashes along the length is usal, each just overlapping the previous. I did not slash these. Bake 30-40 minutes or until the desired crust colour looks about right. Texture is OK, but not as good as that made with softer (9% protein) flour. As I said at the top, I'm still experimenting, and I encourage you to do so too, and post your results. 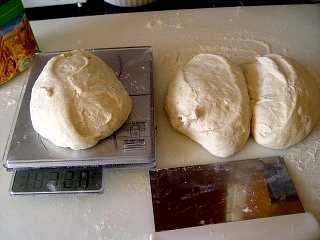 Ther are lots of variables: flour, hydration, mix times, bulk ferment time and temperature, proof time and temperature. Maybe this stronger flour needs longer proof times. I've put the couche with a baguette from this batch in the fridge (in a plastic bag) overnight, and will try baking it tomorrow to see if that makes any difference. I find the shaping technique fascinating. Since it's a very wet dough, I naturally compare it to the Crocodile Bread. That, however, takes 3 days to make but never sees any time in the fridge. 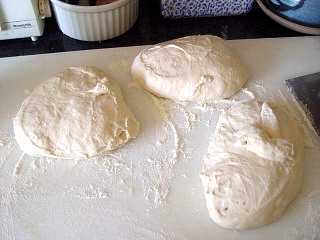 The notion of having a chilled dough to shape is very appealing. And that stretching technique is not like anything I've seen - it's quite cool! The dough in the couche stayed in the fridge overnight - about 24 hours. Baked it off this morning. Nice bread, a typical baguette. It still not as open a texture as I like, given by the softer flour. Jack - thanks for another enjoyable article. I bake a lot of bread using mostly the same technique as yours but with instant action yeast. The high hydration / fast mixing time does give really good results. I do very much like the flavour of the sourdough breads but I have found maintaining the starter (clef?) to be a royal pain. We followed Nancy Silvertons method in her La Brea book. I seem to remember that this involved daily feeding to build the starter. I was wondering if you had any thoughts on a less labour intensive way to get a starter going. Also can you tell me what your feeding schedule is on your starter. If I remember correctly Nancy says that even a refridgerated starter will need some feeding (I may be wrong on this though). Thanks for the demo. One of my goals for this fall semester is to get organized enough that I can get a starter going and bake every weekend! On the subject of cleaning up afterward: I've always had much better luck de-gooping everything with cold water first. I put my dough bowl, as well as any implements, in the sink and add water that's as cold as I can stand. Using my hands, I rub all the goopy surfaces under the cold water, and only once the goop is gone and down the drain do I switch to hot water and add soap. Before I discovered cold water, I killed many dishrags! I've been a happy custodian of Jack's starter since the beginning of April. Not a pain to maintain at all. I just keep 2 small jars in the fridge, taking a tablespoon out now and then to use, usually once or twice a week. Longest I've gone without feeding it was 3 weeks. To shape the bread at 9 in the evening (for overnight retardation in the fridge), I start refreshing the starter at 9 in the morning. If it's sluggish, I feed it one more time at 1 in the afternoon. That's always enough to send it gurgling and bubbling, even to the extent of making a 'great escape' out of the jar. I need more practise with slashing and timing but I've arrived at the crumb which I like. Would love to 'dial' into a successful baguette formula, though. That truly is some of the most glorious looking bread I have ever had the pleasure to lay eyes on. I keep coming back to this thread just to stare at it. Excellent baguette, Jack, especially the last attempt (post 3). I keep saying to myself, "this is made with supermarket plain flour, mixed in a f***in food processor, baked at home in an AGA". The bread has a great texture, what looks like a fluffy crumb with big holes and a thin crust that has torn beautifully, baked with great contrast and not bleakly beige and better than most (perhaps all) baguettes that we can buy in the UK. Great stuff. Can't imagine how to make it better, except by asking, "How does it taste"? Jack - thanks for another enjoyable article..
You are being much to kind to your starter. Mine lives in the fridge for months without attention. When I want to bake, as in this demo, I take a spoonful of the starter and mix it with flour and water to form the sponge. The jar goes back in the fridge. When its looking a bit empty I make a double batch of sponge when I next bake and put half back in the jar of clef. 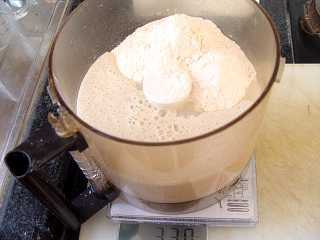 Best way to make a starter is to take equal weights of flour and water and leave in a warm place (30C/90F) until its bubbly. Then referesh it a couple of times, and you are done. Temperature is important as it helps select the right bugs. Well I'd be a fool to turn down an offer of a starter that helps produce a beautiful bread like that!! PM on its way. It's very interesting to hear how little maintenance you have to do to keep your starter healthy. We made ours with organic grapes (to enhance the natural yeasting process) together with the flour and water. There was an extensive and onerous feeding process involved to grow the starter and an only slightly less onerous one to keep it alive. However I've since parted ways with my starter nurturing girlfriend and it since died (requiescant in pace). So a less onerous methodology is definitely welcome. I'm wondering how you maintained a steady 30C for a period of time? Aiee..despite what Silverton says, grapes and the like in starter encourage the wrong bugs. You want bugs that eat flour, not grapes! I use a spot next to the Aga cooker (the Aga is always on) that is at 30C. Other people find a place - over the pilot light, or above the hot water cylinder that maintains the temperature. Others improvise with a picnic cool box and a large pan of hot water for thermal mass. If you are high tech you can build a proof box from an insulated container, a low wattage light bulb or acquarium heater and a thermostat. Well, yes... but to be fair to Nancy that starter did make some stellar bread. She has a fabulous recipe for Fig Anise bread that is fantastic match for a creamy blue cheese and a glass of icy cold Moscato. Jackal, I'm having a ball watching this. Particularly as we appear to be experimenting in such similar ways and with the same techniques. My own flour is a local flour which I get from a mill in Kentucky, an 11% flour that I love. I was increasingly disenchanted with the results I'd been getting with higher percentages of both protein and flour and water ratios, and frankly with all the shaping techniques I've been faithfully performing according to standard instructions. 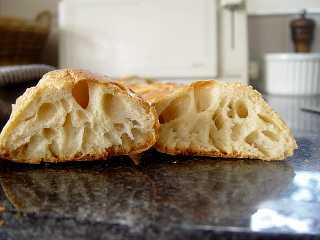 It increasingly has seemed to me that most of those shaping tecnniques take a huge percentage of that lovely, open crumb right out of the bread. So I began using higher percentages of water, more of the folding rather than the tighter shaping I've been used to, and gosh if I didn't start getting results right away. Still, I've felt almost guilty, as if I'm not doing it "right" somehow because I'm not doing it according to the book. I'm happy to see somebody else doing exactly the same thing and getting the same results. But a question. I've been bringing my starter up to room temp at least, and allowing it to start bubbling a bit, before I use it. Do I understand correctly that you simply take it out of the refrigerator and use it to make the sponge? That you use your starter cold? Starter is a confusing term. I take the "clef"(which is what I store from one baking session to the next) out of the fridge and use it cold to build the sponge "poolish", that I then use to build the dough. Since I only use a tablespoonful of clef that is mixed with a cup of water and flour it really makes no difference as to its temperature and I use it straight from the fridge. I would LOVE to post pictures. Unfortunately, we are without a camera at the moment as some baggage handler lifted it as we were going through O'Hare last year. It sounds as if you and I are using "clef" and "starter" interchangably, or that anyway that what you call "clef" I call "starter." I'm using about the same amounts per baking (the small, experimental batches) as you are with your own. I wasn't even thinking about the amount used so much as the um, volatility, for lack of a better word, the liveliness of the stuff. I use mine a couple of times a week generally, but I've been bringing it up to room temp for a couple of hours beforehand. But if I don't have to, then what the heck. I'll try your method next. I've been sidelined by the aftermath of the hurricane, though, so I'm not entirely sure when I'll be baking next. oooh, my sympathy. I hope the starter survived, or do you need more? It warms up when mixed with room temperature or warm flour and water. Since this then ferments for 18 hours or so warming it up to activate it beforehand makes no practical difference. Hi Jack, this is so informative. I have two questions: Where do you get the Vitamin C and have you any advice on protecting the glass in the oven door and light (I think I read about this on another thread, but am not sure where)? I am in the process of reviving a frozen starter and hope to start experimenting soon. I am a novice, so am totally enthralled by this thread. You get Vitamin C (ascorbic acid) from a health food shop or a chemist/drug store. You want the powder, not the fizzy flavoured tablets. If you can't get it, omit it. I don't have any personal experience of ovens with glass in, but some threads mention them. The light can be dismantled and removed. The glass door I don't know but someone mentioned covering it with a double layer of foil. Mea Culpae. Dan Lepard has pointed out that I was using the wrong word - my dsylexia - I meant of course "chef" not "clef". Its a real problem since the terms are not well defined, and change from place to place and book to book. 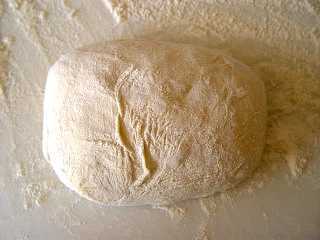 "dough" which is what is baked into bread. Jack - many thanks for the starter you sent. It smells really healthy, almost kind of sweet. I've a couple of observations after having tried my first loaves using this recipe. 1. My first batch was in danger of burning after 30 minutes so I took it off about this point. However it was still underdone in the inside although the crust looked perfect. I think that the reason for this is that I'm guessing you cook yours in the Aga while mine is in a forced air Gaggenau. I'm guessing that those of us using convection ovens will need to use a lower temperature. My next batch I am going to try about 220C. 2. I didn't use Vitamin C in my first batch and I think as a result didn't get the nice open texture of your bread. Have since bought some (nearly £10 for a small jar - ouch!) so am hoping for an improvement here. Also I think I may have let the Starter overproof for 2 hours more than you say., i.e. 14 hours versus 12, and therefore its potency may have died off a little. Anyway next batch is in the fridge, proofing for baking tomorrow evening. Can't wait to see what these adjustments produce. Will let you know the results. That sounds expensive for vitC...should be able to get it from any pharmacy. Vit C doesn't make that much difference. My guess is that you might be over=proving if you are not getting the oven spring and wide open slashes..a hot base, such as a hot pizza stone also helps. Keep practicing, and you'll get there! If you use froogle.google.com or a local homebrewing supply shop, you should be able to get reasonable prices on vitamin C.
I had the same experience (using a Smeg). I also didn't get much of a rise in the bread, which meant it was very dense, although it did have some nice "aritisan" looking holes. I put my failure down to not using the Vitamin C and cooking the bread in one large round on a pizza stone (as opposed to two long baguette). I have since used the starter for ordinary sourdough bread, and it's working well, so this can't be my weak link. I'd be really interested to hear your progress with this. 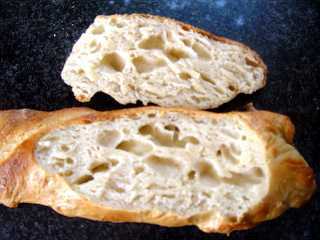 Dense, poor rise, and a few large holes are symptoms of the bread being under-proved. The baguette demonstarted relies on a very active and well feremented starter. If its not working for you, try proving the baguettes at room temperature for 4-6 hours after shaping. 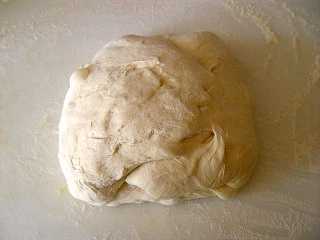 The dough will be much softer, and you might then want to chill it before handling. Well that was much better. Observed the correct proof times and set the oven at a lower temperature. Used the Vit C also. Got some nice open crumb and not too brown crust. However the texture was still a little dense. 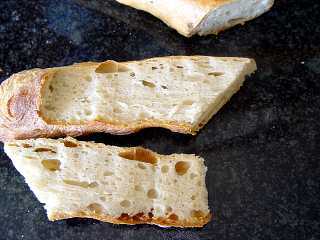 Also the crumb of mine looks a lot more like that of a typical Poilane style loaf i.e. not as open and light as Jack's. The bread itself is quite dark and goes nearly rock solid in a day or two. So some progress still to be made. 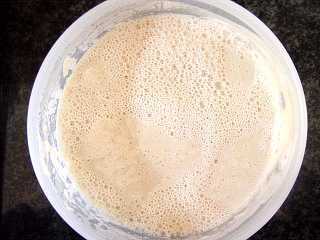 I am wondering if my starter may have weakened a little in its postal journey from stately Lang towers (...anything rather than admit a failing in my technique). For a couple of days I didn't have it in an airtight container and it had got a little dried out. 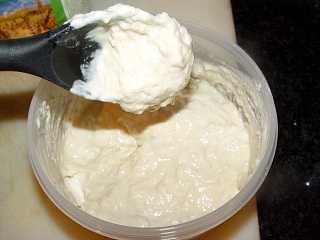 I had re-moistened it with a 50/50 flour water mix plus a spoonful of the starter itself. Jack - any tips on bringing the starter up to fighting strength again? Will also try your proofing variations. Jsalomon - thanks for the Froggle tip. Will try that next time. Have enough to do me for a while now. Corinna - I preheated the oven (with my tiles in them) to 250C, put the bread in, and turned down to 220 after 2 mins. Cooked for 35 minutes total. This was much better, though possibly still very slightly undercooked in the centre. The bread was a much nicer colour and texture. I'd recommend trying the Vit C as well. For my next batch I am going to preheat to 250, cook for 2 minutes and then turn to 210 and cook for 40-42 minutes total. I think that will be perfect. Also if you are worried about your oven light (although I think that the ones in the Smeg are pretty robust) can I suggest that you place a pan or oven tray directly on the floor of the oven and just pour some boling water in there immediately prior to putting the bread in. I then pour some more water in after 2 minutes and this gives great results. Another technique is just to spritz the oven walls using water filled spray gun. If you refresh the starter a couple of times - throw out 2/3rds and then feed it with equal weight of water and flour, ferment out for 12 hours and repeat it should be happy, bubbly and voracious. Temperature is important, warm, around 30C.